The EUCENTRE bi-axial Bearing Tester System is designed for testing of full-scale bearing and isolation devices, with 5 degrees of freedom and with high dynamic and force capabilities: vertical force up to 50000 kN and horizontal force up to 2000 kN with horizontal displacement of ±480 mm. 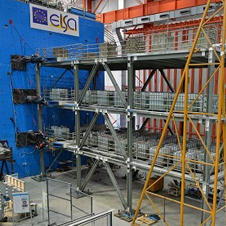 This experimental equipment is unique in Europe. During the test it is possible to dynamically control the vertical force and displacement and the rotations of the three principle axes, with the following specifications. The Bearing Tester System also features an additional component for the execution of full 3D tests (6 controlled DoF). With an alternative actuators configuration, the peak horizontal force can reach 2800 kN.